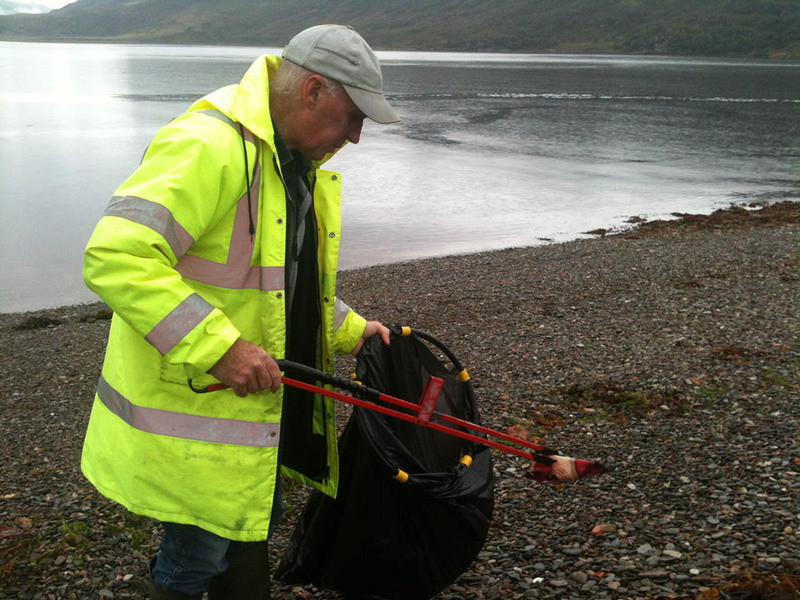 On Thursday I caught up with Dougie MacCrimmond the official beach cleaner in Ullapool, who has been cleaning the beaches for the last six years, we walked and talked while picking up pieces of litter along the western stretch of the beach. 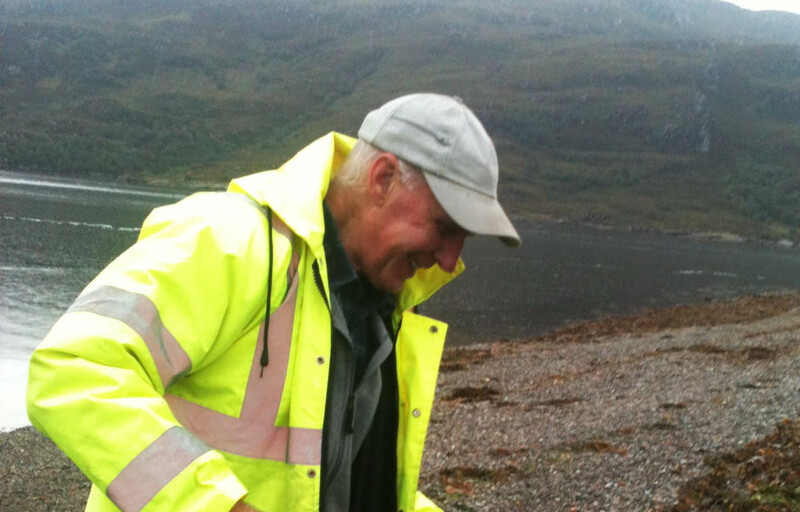 Dougie is employed by the Harbour Trust like his predecessor before him. 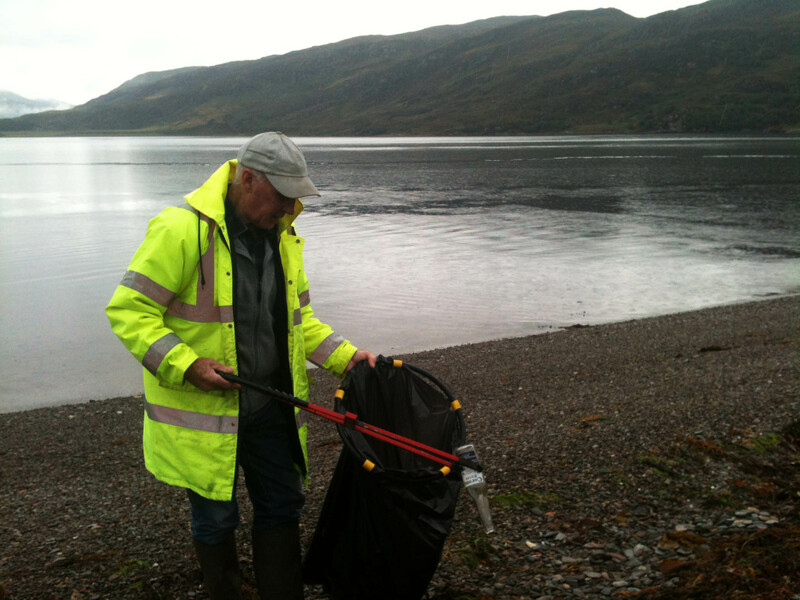 As we walked I made my usual list of litter objects found each day while walking approximately 100m of the strand line along the beaches in and around Ullapool. I hope this catalogue of lists will help me map the distribution of different types of litter and its sources, some being more obvious than others . As Dougie cleans the beach between three and four times a week. 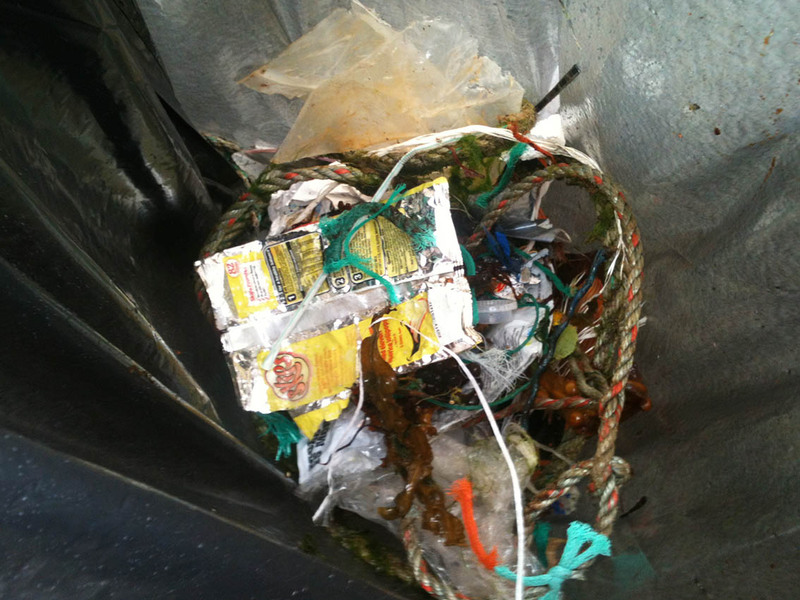 This explains why the amount of litter seen on the beaches is relatively low compared to other coast towns and you only see the odd bottle, can or lump of polystyrene. 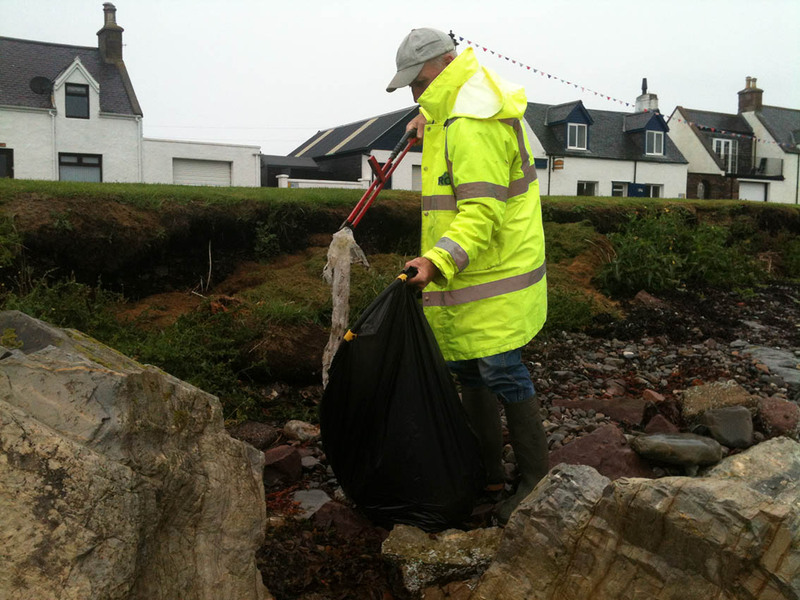 He tells me how the amount of rubbish depends on the wind & tides and when there has been a big storm he will come and do an extra days cleaning. I must ask him next week whether the amount he collects is also influenced by the number of tourists in the town. We discussed how the smaller particles get caught and lodged between the rocks. We talk about how overwhelming the amount of plastic on the beaches has become in the last 20 years and Dougie adds ‘That Stuff never vanishes’. We mused on the how to counter responses from people when we approach them about leaving litter. Responses we have heard include’ The most usual response being ‘I am keeping you in a job’ or ‘I’m keeping the council workers in a job ! Neither of us could come up with what words could persuade them to take their rubbish away and put it in a bin. Any ideas? As we walked off the beach talking about the issue of the day following a very wet and wild week i.e the outlook for the afternoon Dougie told me ‘We say sometimes the rain never forgets to go here’ , but as I walked away the rain did stop but unfortunately I could see another piece of plastic I had missed. 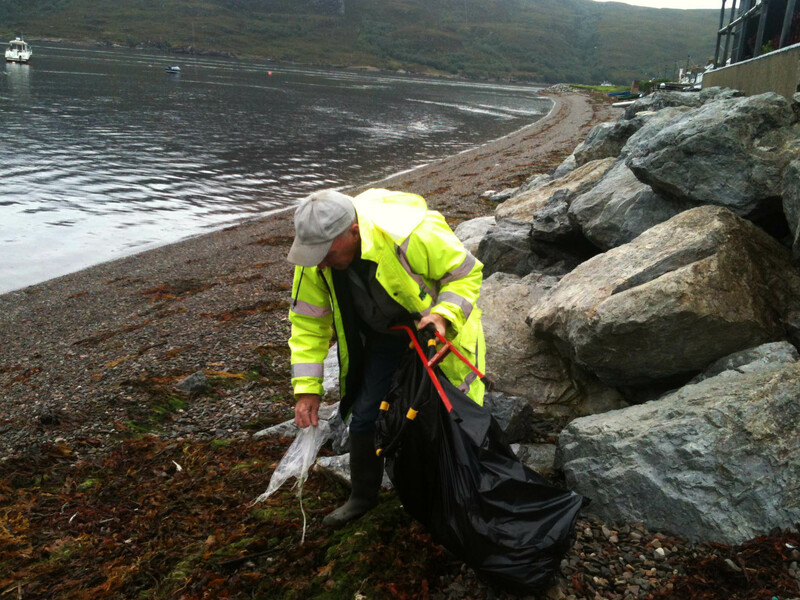 By the end of our short walk he reckoned he had collected about 56lbs of rubbish in his bag , several hundred pieces of rubbish.